Dumb, empty movie with mostly boring or annoying characters, plot which makes no sense and weird CGI. The first and original movie aged well but this crap looks more fake than it and even if I was a kid todays, JW would not cause any dino-obssession to me. Leave the classic alone and stop making these stupid remakes!!! CGI looks more fake than in the first original movie from 90´s. The stuff around dinosaurs is over-the-top, basically normal dinosaurs are not enough for the visitors, so they create mixed breeds of dinosaurs and other animals. Maybe to cover the bad CGI. The only quite likable character here is "Star Lord". Annoying ASAP-communicating manager with ugly make-up and hair and attitude unfortunatelly wasn´t brutally killed (in fact she was supposed to be the lead female character). The kids are mostly annoying too. Everything what worked in the original doesn´t work here or is not here at all. The idea of training raptors with clicker wasn´t that bad, it turned them from deadly monsters into normal intelligent animals. 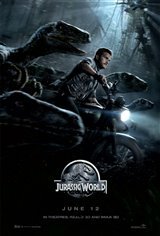 The movie contradicts itself when at first it is said that Indominus rex was growing up in solitary and can´t communicate with anyone, and later it communicates with raptors. The authors were not able to create canon and establish some rules, even fictional. The same thing all over again. Except this time it's really stupid and you'll be begging to see the annoying lead characters eaten, especially that insufferable little kid. A hollow, soulless experience. The series is simply parodying itself now. I watched the first part then got annoyed because it was so boring and I turned it off. Terrible. Created for the mediocre. Disappointment from the beginning to the end. My first time in a theatre in many years and this was very enjoyable. Also my first time viewing an Imax/3D picture and I almost felt like a kid again. The plot to this movie is somewhat predictable however, it makes up for it with a comic edge and the action sequences combined with creative special effects are great, although not overdone. The CGI is excellent as the dinos look very very real. What is also surprising is that there are no swear words, so it is acceptable for the children albeit scary.